National Preparedness Month was recognized Monday at the Delaware City Council meeting. The meeting began with an invocation by Police Chaplain Dan Maurer that reflected on the terrorist attacks of Sept. 11, 2001, as well as the recent hurricanes which have hit the United States. Following cursory business, Mayor Carolyn Kay Riggle read a proclamation to Police Chief Bruce Pijanowski and Fire Chief John Donahue. The city’s proclamation encouraged citizens to learn to prepare for all types of emergencies, “from potential terrorist attacks to natural disasters,” Riggle said. Donahue said Sept. 11 is a somber day as a result of the terrorist attacks; and a similar tragedy is currently playing out in Florida with Hurricane Irma, as well as in Texas with Hurricane Harvey. President Donald J. Trump proclaimed September 2017 as National Preparedness Month. The proclamation goes on to state that Americans can start today to improve their readiness in case of disaster. For more information, visit https://www.ready.gov/september. 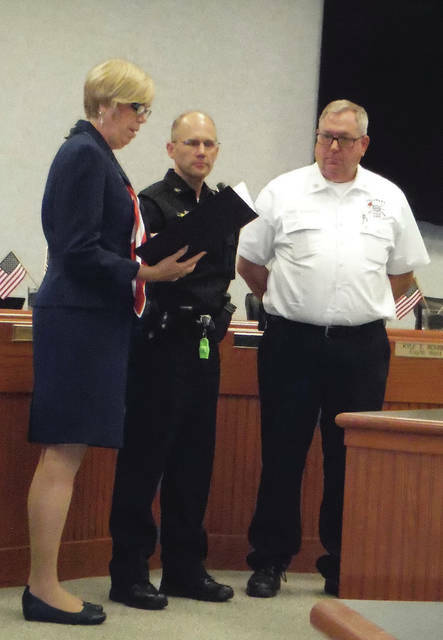 Mayor Carolyn Kay Riggle, left, reads a proclamation to Police Chief Bruce Pijanowski and Fire Chief John Donahue at the Delaware City Council meeting on Monday. September is National Preparedness Month.